HomeNo lions, no tigers, but bears, oh my! City Lights Theater Company is again hosting a South Bay premier. This time it is playwright Lauren Gunderson’s revenge comedy, Exit, Pursued by a Bear. Gunderson took her title from a famous stage direction in Shakespeare’s The Winter’s Tale, and it sets the tone for the sometimes frenetic tempo this gripping play keeps. The story presents a satirical look at domestic abuse. In her online dramaturgical notes on the play, Gunderson describes her characters thusly. Nan Carter (Sara Renee Morris) is “pretty and quick, like deer.” Kyle Carter (Max Sorg) is “a big messy boy, like a dumb dirty dog.” Simon (Jacob Marker) is “pretty, strong and bitchy, like a slim cat.” Lastly, Sweetheart (Laura Espino) is a “stripper, dressed as the incredibly hot version of Kyle.” Nan is also quite the Jimmy Carter fan. Though she is not related to him, she wishes she was and often quotes him for inspiration. These are very colorful descriptions to be sure, but they are extremely accurate. We meet these Northern Georgians very early in this fast-paced, one-act play. 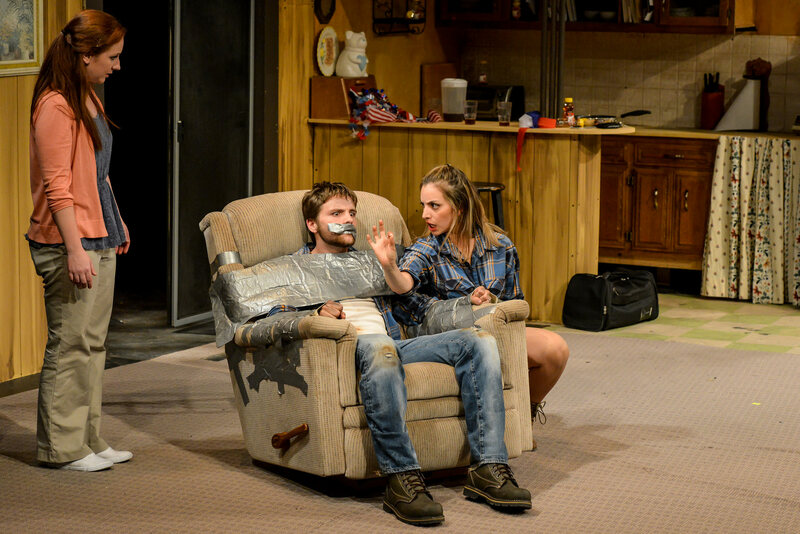 Nan has arranged to have her friends Sweetheart and Simon help her reenact scenes of her life with her husband Kyle so Kyle can understand why she has him duct taped to a chair in their remote mountain cabin. Nan has plans to leave him for the bears to eat once she and her friends finish their theatrics and head off to LA. Ron Gasparinetti’s set brings the rustic cabin to the stage. It’s not hard to imagine being transported to the mountains of northern Georgia, with a kitchen full of illegally obtained venison filling the whole refrigerator, or the living room floor as the case may be. All of the essentials are there including the comfy chair to which Kyle is attached, very old wooden kitchen cabinets, and a sliding screen/glass back door. Of course no mountain cabin would be complete without a deer head mounted prominently someplace, in this case over the kitchen door. A wooden panel hangs from the cabin ceiling center stage upon which stage directions are projected, sometimes stating the obvious in a humorous fashion. Director Steve M. Boyle’s staging brings the action close to the audience. All of the characters have their private moments in a downstage spotlight as they confide in the audience explaining their motivations, and setting various scenes. The first reenactment is between Nan and Sweetheart with Sweetheart playing a seething Kyle. Morris and Espino are very physical in their reenactment when “Kyle” flies off the handle for no reason and decks Nan. Nan gets him back by beaning him with a frying pan, which we learn is how she incapacitated him long enough to tape him up. Sweetheart eventually removes the tape covering Kyle’s mouth to let him speak for himself. Kyle reveals that he wrecked their truck when he hit a deer. He also reveals that the dead deer is in the back of the truck which provides some fodder for subsequent action. When Marker’s Simon bursts in wearing a female cheerleader’s outfit, short skirt and all, he steals the scene. Simon has been Nan’s best “girlfriend” since grade school. He’s very protective of her and doesn’t want her to back out of the plan. Marker and Morris have strong chemistry, exhibiting a very believable closeness. After his entrance, Marker quickly changes into warm-up pants, but keeps his cheerleading colors (and pom-poms) in play. Much later, Kyle escapes from the chair for a short time, and he and Nan reenact the very early days of their meeting and courtship. In these moments, Kyle comes across as a likeable country boy. There’s really no inkling from his behavior that a monster resides under his playful, impish exterior. Sorg’s portrayal swings the widest of all of the characters, going from a potty-mouthed brute following the example of Kyle’s father in justifying beating his wife, to being quite humble and sensitive. As is so common in abusive relationships, when Kyle turns on the charm and remorse, Nan almost forgives him. Simon comes to Nan’s defense in a surprising way to prevent her from backtracking as she had evidently done in the past, and they have a number of very funny moments as they banter playfully at Kyle’s expense. One aspect of the writing that might make the play slightly limiting is its current popular references to various technology and restaurants. The themes will remain relevant as they serve to raise public awareness of spousal abuse, but the popular references will need to be updated over time. As the story spirals to its finale, the action becomes more bizarre and fragmented. The conclusion is clear, but the frenetic location and situational shifts are not very polished. Still, the play is hard hitting, witty, and worth seeing. Regarding the subject matter, Gunderson says Exit, Pursued by a Bear is “a violent play that glitters.” Yes, it does. When: Thursdays – Sundays through 14 June 2015. See cltc.org or call 408-295-4200 for more information. ← Here’s to you, Frankie Payne!